This is the third of four posts covering the Skype Shop – an introduction, qualifying products offered, learning about an individual product and, finally, making purchases and follow-up. 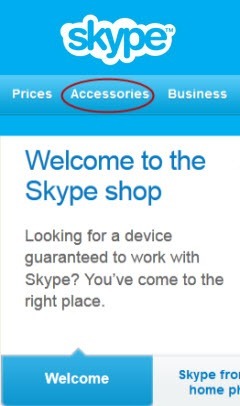 The first post of this series provided an over view of the Skype Shop (or Skype Store) and how to locate catalogue pages listing categories of accessory products that can enhance the Skype calling experience. The second post provides the background what qualifies a product to appear on the Skype Store. Having presented what amounts to a catalogue of hardware products available on the Skype Shop, the next step for the user is to select a product and learn more about it beyond its name and price. As described in the introduction post, a prospective buyer can filter down initially to a product category and then filter further by sub-category to get to a page listing all the products within those filters. However, the prospective buyer wants to learn more about the product and any user feedback. The content of the Details tab is each featured retailer’s opportunity to outline those product features it feels will help sell the product; Details also lists any certifications and contents of the box. The Requirements tab provides information such as operating system compatibility and any specific hardware requirements (USB port, power connection, etc.) that the user must have available in order for the product to work. 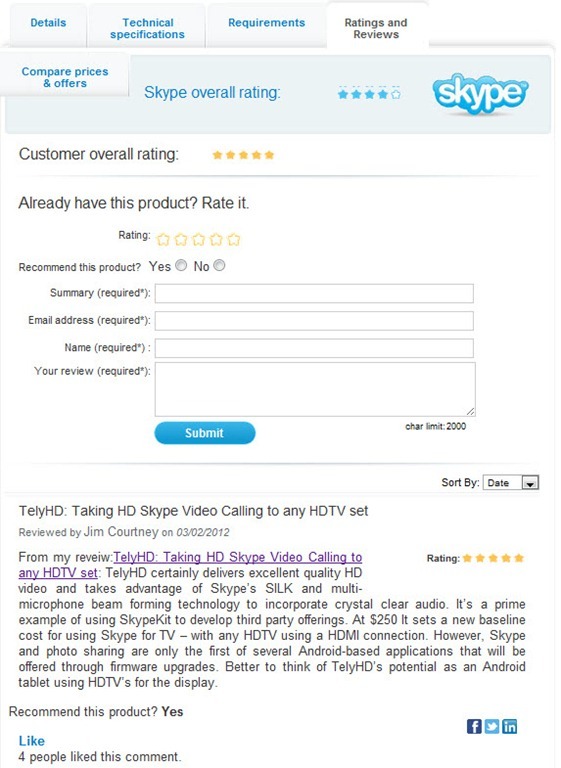 New in the revamped Skype Shop are the opportunities for customer feedback (a la Amazon) via the Ratings and Reviews tab and the comparison shopping via the Compare Prices and Offers tab. The goal here is to allow the buyer to make a more informed decision in the overall market. While showing the “Skype Rating”, the most significant value of the Ratings and Review tab is the opportunity it gives customers to both rate and, optionally comment on, a product. It’s intended to be a feature similar to reviews on the Amazon (and many other e-commerce) stores. All comments are moderated to avoid spam and other inappropriate off-topic content. There are also opportunities to use social networking tools for Facebook Likes and Comments, Twitter and LinkedIn. In order to set up and test a feedback example I submitted a Rating and Comment for the TelyHD as shown on the right (Click on the image for a larger view). Comparison Shopping content goes here. The Comparison tab provides access to other stores that are selling the same product. In the example on the right, Microsoft webcams can be purchased at up to seven different e-commerce retailers, including the “Featured” Microsoft store. Note that, while Skype hosts the product catalogue for the Skype Shop, the actual transactions are handled by various web-based retail sites, including eBuyNow.com (formerly InStoreSolutions), Chat and Vision, eBay merchants, Amazon Marketplace and Buy.com. 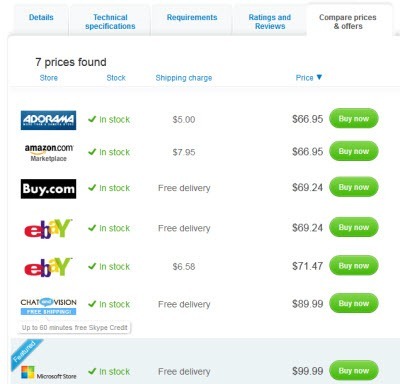 Shipping charges are included in the comparison. In some cases, such as Microsoft, FREETALK and Logitech, the Featured retailer is the hardware manufacturer’s own e-commerce store with no distribution channel to other retailers. In practice, the Skype Shop comprises 70 separate country-specific stores, selling products in over 40 currencies and 12 languages. Due to issues such as currency, retail taxes, power connections, language, distribution locations or other country-specific issues such as regulations and import requirements, products are are only listed in a country’s store if they are available for shipping to destinations in that country. Usually the store associated with the user’s country-specific IP address will be the default store seen by the prospective customer. You can change the country by going to the drop down box at the very lowest left corner of any Skype Store web page. However, it is the destination country for a product’s shipment that must be used for making a final purchase. More details on the various retailers and their responsibilities will be covered in the next post discussing the handling of transactions as well as delivery, currency, taxes and follow up support. Disclosure: The vendor of the FREETALK Everyman USB Headset, eBuyNow, was a client of the author for a two year period, ending February, 2011. It is taken as an example for two reasons: it sets an excellent example to demonstrate the difference between certification requirements and “features”, and I am still using one after 2.5 years simply for its convenience and performance. And of course it’s quite durable. Also, there are no affiliate links in this post.